This is perfect for those who want the quintessential bridal look of a tiara. A crown tiara is great on short hair, while long hair demands to be piled up high for fine or mid-length hair, try adding a hairpiece. 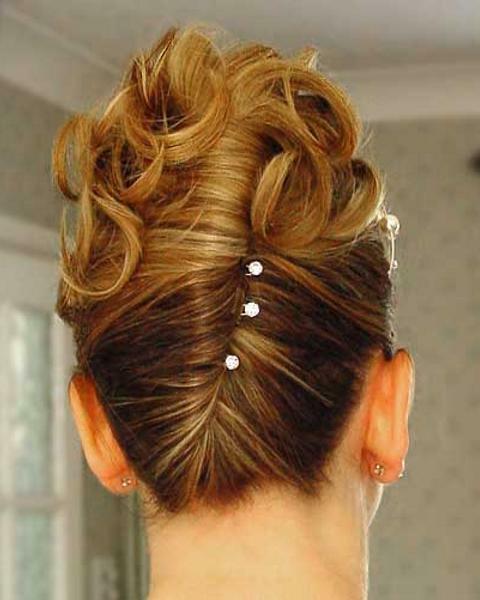 Ultra-glossy hair is swept back and secured into a French pleat using fine pins and matt grips A small circular tiara is placed onto the crown, and a plaited section of tear is positioned inside and held in place with hair pins and hairspray. The root area of freshly blow-dried or set hair is back brushed. The nape section is swept up to the crown and secured with matt grips. The top section is brought over, wound down onto the mid-section and fastened with matt grips to create a soft roll. Accessories or feathers can be added to the base of the roll. The hair is set on medium-sized rollers using a fine flexi-hold hair spray. When cool the rollers are removed and the curls are broken up using a large-toothed comb. Using fingers as a comb, the hair is shaped around the face in large sweeping waves. For gentle hold, hairspray is applied to the fingers and run through the hair.